Dough conveying with mechanical transfer system. Dough conveying is the transfer, flow, or movement of amounts of dough via conveying equipment. Dough can be transferred from one equipment to another by using conveying units. In large-scale bakery plants, the large masses of dough produced during mixing, usually ranging from 200 Kg to several tons, are moved along the production line by conveyors. This reduces or eliminates the need for the manual labor involved in dough handling. How does dough conveying work? Dough conveying systems fills the gap between the mixer and the dough dividing equipement. It is a smooth-handling system that moves dough from one stage to another in an efficient and productive way. A band or belt conveyor that normally connect dividers with rounders, and rounders with the rest of the production equipment down the line. An auger or endless screw, also known as a dough pump. Often connecting mixers and dividers, this type of conveying equipment is commonly used in continuous mode production environments. It requires a high level of automation and is usually found in large-scale production bakeries such as white pan bread production plants. Discrete or single pieces of specially shaped dough, can only be moved by band or belt conveyors. *The arrow symbol (→) represents dough conveying systems. Since the oven turns raw dough into bread by baking, we cannot use the term “dough conveying” system after this step. 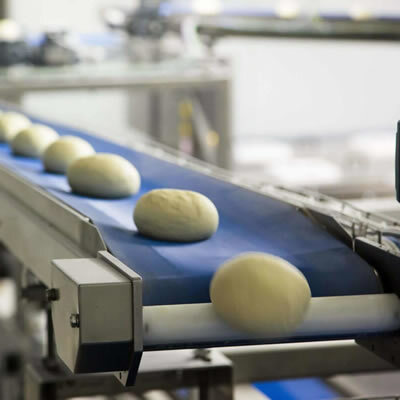 In a high-speed bakery plant, dough conveying systems are fully mechanized and are usually connected to the supervisory control and data acquisition system (SCADA). These conveyors are then centrally supervised and controlled electronically. In some cases, dough conveying systems are used occasionally or temporarily (e.g., in production peaks), and hence may not require permanent connection to the line. However, they may still need to be set manually, e.g., belt speed. Whether the conveying equipment is designed as closed or open equipment, it should as any other product-contact surface, allow for maintenance, inspection, cleaning and sanitation activities to be performed easily, adequately and quickly to reduce downtime. Dough conveying equipment should be properly designed, constructed and installed so as to preserve food safety in the production environment. This is important since dough pickups on conveyor surfaces could cause cross-contamination if various types of bakery products (allergenic or gluten-free) are processed in the same line (shared line). Dusting flour and/or oiling conveyor product-contact surfaces to manage wet and sticky doughs are possible options, but the costs of doing so should be appropriately considered. The design of the food-grade material used as band or belt should be such that minimizes dough pickup. AIB International. Bread Manufacturing Process, Distance Learning Course, “Part 2 Module 01 – Dividing.” https://www.aibonline.org/Start-Your-Training/Baking/Baking-Foundations/Bread-Manufacturing-Process-Online, 2018. I am a novice baker. By that I mean that I often bake at home, but nothing beyond that. However, I am curious about how airflow under artisan, or soft dough, bread helps keep them from sticking to the conveyor belt. I would have just assumed that the belt would be made of a silicone substance that dough wouldn’t stick to in the first place. Dough conveyors are also used after make-up when “retarding” of the dough is required. Usage of scrapers is often necessary with the release of dough from the conveyor belt.